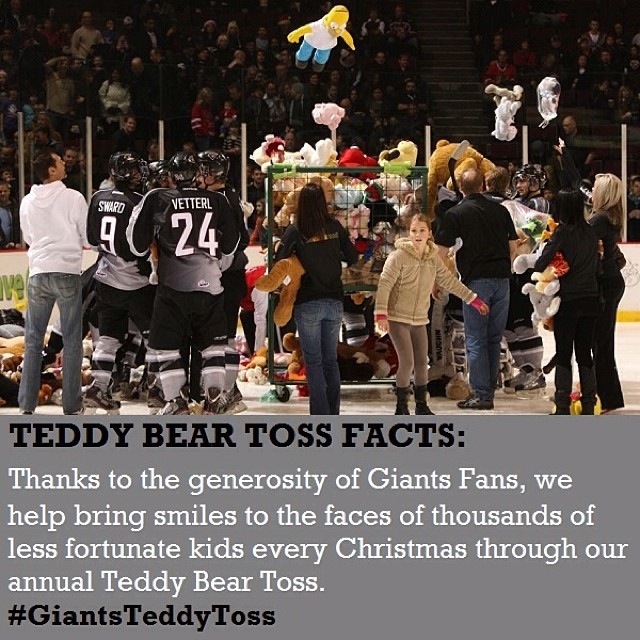 Presented by BC Honda Dealers and Global BC, the annual Vancouver Giants Teddy Bear Toss is coming up on Friday, December 13, 2013 when the Giants take of the Everett Silvertips at the Pacific Coliseum. Fans are encouraged to bring a new stuffed toy to the game, or you can buy one on the concourse for $5 with proceeds benefitting The Province Empty Stocking Fund and the CKNW Orphans’ Fund. When the Giants score their first goal of the game, throw your teddy bear donations onto the ice where they will be collected. The Lower Mainland Christmas Bureau will then make sure they find a warm, loving home in time for the holidays. Tickets are selling fast so be sure to get yours today by calling 604-4-GIANTS (604-444-2687) or by purchasing online. Follow the Vancouver Giants on Facebook and Twitter for more information.